If you want to get fancy you could press pieces of carob or chocolate into the tops of the cookies right after they come out of the oven. I did this recently with 1 inch heart-shaped pieces of chocolate, and the result was cute and delicious. 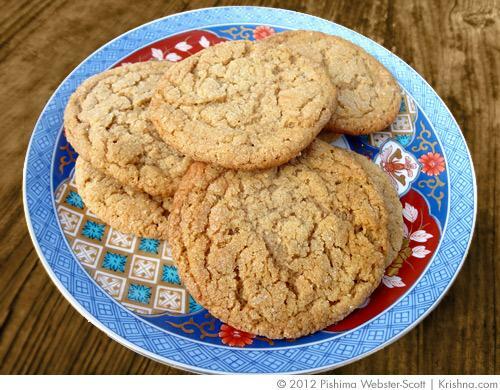 However, plain peanut butter cookies are delicious enough on their own so give them a try. 2. In a small bowl combine the flour, baking soda, baking powder and salt. I like to sift the ingredients together to make sure they combine evenly. 3. In a larger bowl combine the brown sugar, peanut butter, butter and yoghurt. Mix either with a spoon, or in a mixer until well combined. Combine the dry mixture with the wet mix and stir until fully incorporated. 4. Make the dough into balls of about 1 1/4 inches in size. Roll the tops of the dough balls into the granulated sugar and place approximately 3 inches apart onto an ungreased baking tray. 5. Bake cookies until light brown, about 10 minutes and then remove from oven. Let the cookies cool for a few minutes on the cookie sheet and then remove carefully and place them on a wire rack to cool.